Cet article explore une méthodologie innovante de recherche par la pratique qui rassemble praticiens et aficionados d’une culture populaire avec des chercheurs académiques, dans l’espace partagé de symposiums sur la culture sound system du reggae. En tant qu’organisateurs, nous décrivons ce qui a rendu ces symposiums différents des conférences académiques habituelles, en termes de participants, de sujets de discussion, d’ateliers, de démonstration, d’expositions, de projections de films et de sessions sound system par Roots Injection et Young Warrior. D’une manière autoréflexive, nous considérons que les résultats de ces évènements incluent des échanges intergénérationnels, le soutien aux sound system menés par des femmes, et la reconnaissance et l’encouragement que les praticiens de cette culture populaire disent avoir ressenti de la part de l’institution académique qu’est l’université. Cela peut être identifié, à travers des enregistrements vocaux ainsi que des commentaires sur les réseaux sociaux, comme une renforcement mutuel de la culture de recherche et de la culture populaire du sound system elle-même. This paper explores an innovative practice-as-research methodology that brings popular culture practitioners and aficionados together with academic researchers in the shared space of symposia on reggae sound system culture. As organizers, we describe what made the symposia different from the normal academic conference in terms of the range of participants, discussion topics, workshops, demonstrations, exhibitions, film showings and the sound system sessions from Roots Injection and Young Warrior. In a self-reflexive fashion some of the outcomes of the events were considered to be the intergenerational conversations, the support for women-led sound systems and the recognition and encouragement that the practitioners of the popular culture said they felt they were receiving from the academic institution of the university. This can be identified via voice recordings and social media comments as a mutual strengthening of the research culture and the sound system popular culture itself. 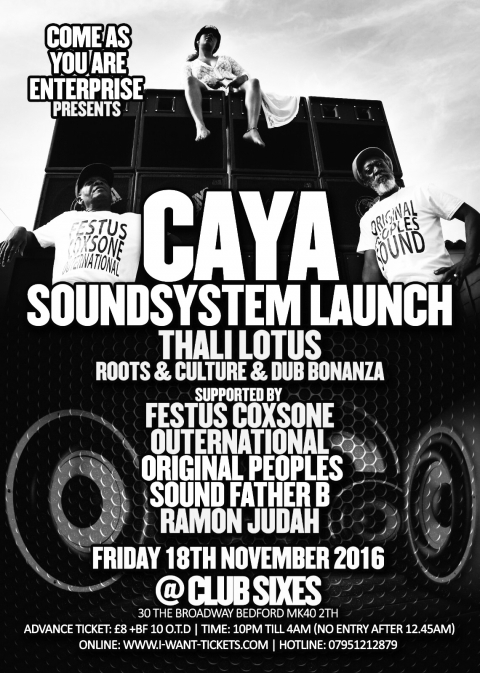 1 https://soundsystemouternational.wordpress.com/ (accessed 8th March 2017). 1Sound system culture originating in Jamaica is now a global popular music movement. This paper outlines an example of a practice-as-research methodology with reggae researchers and practitioners participating. 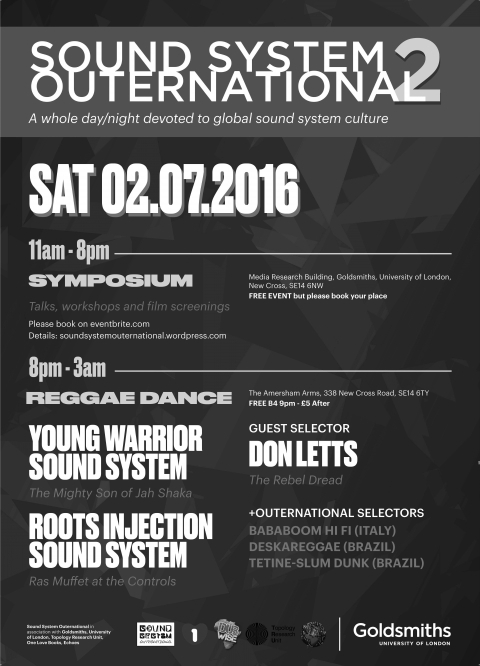 Sound System Outernational 1 and 2 took place at Goldsmiths, University of London, in January and July 2016. First to declare our interests, the authors were the organizers of these events, having founded an on-going research group called Sound System Outernational, “dedicated to recognizing, stimulating and supporting sound system culture worldwide… [it] creates spaces for dance and discussion.”1 This makes the article a self-reflexive piece, where the events themselves are considered as an example of practice-as-research. 3As against most practice-as-research, Outernational was concerned with sound system as a collective rather than individual creative practice, as part of a popular rather than high art or avant-garde cultural tradition. Also some of the value of the symposia lay in the fact that mainstream media have traditionally not recognized sound system culture as having any significant value. Until very recently the UK urban music of Grime was exactly in this position of being entirely excluded from mainstream media, as one participant, Joy White addressed in her presentation Calling the Past into the Present: Sound Systems and a Decade of Grime at the second event (White, 2016). 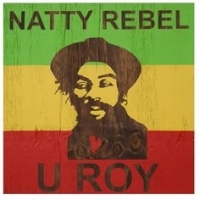 Even if it may occasionally surface on a mainstream level, such as with Channel One’s surprise victory at the Red Bull Culture Clash in 2010, reggae sound system culture is not a fully commercial music culture (in the way that Grime is rapidly becoming with Grime artist Skepta winning the UK music industry’s prestigious 2016 Mercury prize), but conforms more to the idea of a subculture, often operating in the margins in an informal economy and retaining its Caribbean identity. So the popular culture of sound system culture indicates grassroots, lumpen proletarian or subaltern, as distinct from the mass popular culture of Beyoncé or Major Lazer. The third respect in which the creative practices considered here differ from traditional ones is in the role of technology. Sound system culture is almost entirely phonographic, this is to say, the music played by the selector is not a “live” artist performance, but a recorded one, re-presented, as it were, by the technologies of the sound system set of equipment. 4Arising from the most deprived areas of 1950s Kingston, Jamaica, later displaced along the routes of the Afro-Caribbean diaspora, this wisdom or “sonic intelligence” is a collective, transnational, multi-layered body of knowledge. Ranging from the affective qualities of sound to the techniques for its re-production, this practice-based wisdom mainly relies on a radical approach to audio technology. Working with one foot in the recording studio and the other in the dancehall session, as recently accounted by Ray Hitchins (2014), Jamaican engineers have always made clean sweep of the manuals. Pushing technology far beyond its intended limits, they eventually invented a sound the rest of the world strives for, with the sonic extravaganza of dub to be considered one of the most perfected achievements, as argued by Michael Veal in his classic work (Veal, 2007). It is always difficult to find ways to convey the affects of the sound system experience and its visceral impact. One Brazilian in her comments from the floor of the first Outernational put this very well. She said that as a student she couldn’t afford to travel back to Brazil—so going to sound system sessions was the only way she could experience herself as an embodied person, in the way she was at home. 6The field of popular culture offers countless examples of different paradigms at work in the production and transmission of knowledge. As an example the idea of an embodied knowledge, proposed by phenomenologist Merleau-Ponty (1964) and later expanded by the feminist critique, resonates throughout a long tradition of scholarly research on dance and choreography, from Afro-American dancer-theorists Katherine Dunham (1947/1983) to Barbara Browning (1995) and Ann Cooper Albright (1997). But we could also claim the call into question of the primacy of the rational mind to be already at work in the artistic practice of self-taught musicians, from Louis Armstrong to Jimi Hendrix. The idea of ways of knowing and the sonic logos challenge the conventional epistemic monopoly of the nature of knowledge itself, as explored elsewhere (Henriques, 2011: 242-274). This line of thought also resonates with idea within the Jamaican popular culture itself, where “reason” is not a thing, a noun, but rather an activity or verb, where the expression “to reason” and “reasoning” are commonplace. 7The circumstances—or what Stuart Hall would discuss as contingencies—appear self-evident in retrospect. The three organizers had a common research interest in reggae music and experience with sound systems. D’Aquino owns and runs the Bababoom Hifi sound system and record label (and previously the Roots Defenders band) in Italy for the last twelve years and is currently a PhD student at University L’Orientale (Naples, Italy), making use of the critical tools provided by the cultural studies tradition, relocated from the Birmingham Center for Contemporary Cultural Studies to the Mediterranean area by Iain Chambers.3 Vidigal is a member of Deskareggae Sound System, from Belo Horizonte, his hometown in Brazil where he teaches Film Studies. His experience combines 24 years in documenting and studying the Brazilian reggae scene, since the release of the Massive Reggae fanzine in 1992, with a theoretical work on the interaction between popular music and the visual element in feature films and documentaries. Weapon is My Mouth was his new film shown at the event, as described below. In terms of a research and practical knowledge base in reggae sound systems, Henriques has documentary and fiction films, numerous journal publications (e.g. Henriques, 2014) and a monograph Sonic Bodies to his name (Henriques, 2011). 9The renewed recognition of the value of reggae is also evidenced in two 2015 exhibitions, namely Michael Macmillan’s Rockers Soul Heads and Lovers and Mandeep Samra’s Sound System Culture national touring exhibitions, the latter accompanied by the beautifully illustrated and produced book Sound System Culture that chronicled its origins in Huddersfield (Huxtable, 2014; see also Bateman & Newman, 2016).6 So the publishers One Love Books and the Sound System Culture organization were obvious choices as associated partners for the Outernational venture, as was Echoes magazine, long established authority in this area. With these working relationships and what we found to be the kudos attached to Goldsmiths—from those outside the university sector—it was comparatively easy to reach out to local sound systems and for them to consider our request for their participation seriously. An essential factor for the positive outcome of the event was the mutual trust between organizers, academics and practitioners. The marginalized nature of the reggae scene is largely outside the mainstream music industry that means that it is not immediately accessible for research purposes or even participation. 10The Outernational events were only possible on the basis of the already-established trust and support of the sound system community that operates largely with its own venues and promotional mechanisms, such as the pirate/community radio station advertising. Also the events were facilitated by the fact that they were feeding an already existing appetite—from researchers to be in conversation with practitioners and for practitioners to have their work and contribution to the culture being recognized. Several participants mentioned “starving” for the kind of conversations that flowed so readily at the events. Although temporary, the academic symposium provides a physical “third space” for people to gather and meet each other, building networks and exchanging ideas. This is in fact what the space of the dancehall session aims to provide through the sound of the phonographic reproduction. In the Rastafarian nomenclature the events would be considered as a “groundation” at which we were “reasoning.” In one sense this was our aim for the symposium: to create a shared space that is achieved at the best dancehall session and at the best academic conference—but where those two usually different sets of participants came together. 11The two symposia had several themes in common.7 One was their outernational perspective with presentations from Dr Sonjah Stanley Niaah (Jamaica, researcher via Skype) and Taru Dalmia (India, Delhi Sultanate sound system via Skype), and practitioners such as Pax Nindi from Zimbabwe. 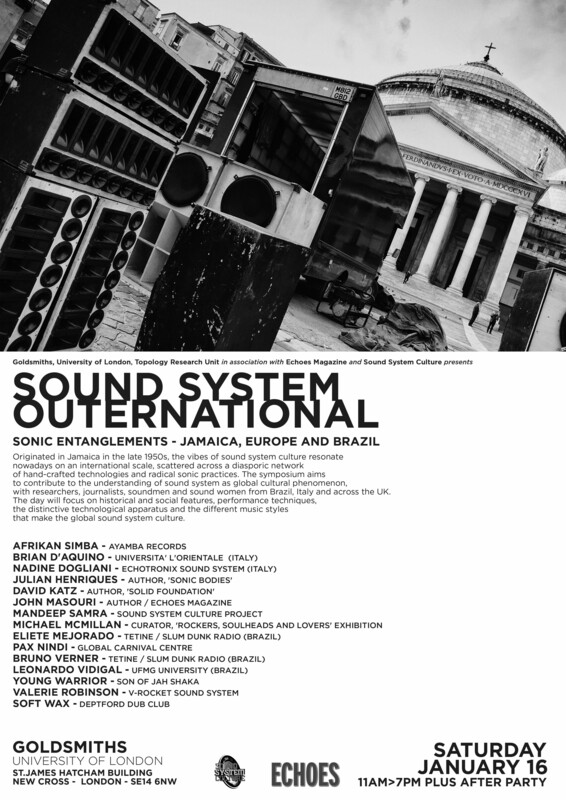 Also with the second symposium the outernational scope widened further to Brazil with addition of Bruno Verner (Goldsmiths, Tetine sound system) and Eliete Mejorado (Slum Dunk sound system and Brazilian punk-funk duo Tetine), and Norway with researcher Vincent Møystad. Another common theme was their intergenerationality. Participants from both older and younger generations were very keen to make the connections and indeed learn from the other. Young Warrior advertises himself as son of Jah Shaka for instance, and there was a contribution from Everald Campbell as son of the pioneer soundman Count Suckle. The third common theme was of course the mix of backgrounds of presenters and participants as practitioners and academic researchers, some with both backgrounds such as Dr Mykaell Riley (University of Westminster and a former member of Steel Pulse band) and Dr William “Lez” Henry (University of West London and a former member of Saxon Sound System). There were also curators such as Dr Michael McMillan and writers on reggae David Katz (People Funny Boy: the Genius of Lee “Scratch” Perry) and John Masouri from Echoes magazine, as well as sound system owners such as Steve “Soft Wax” McCarthy, in addition to those already mentioned. 13One of the advantages of organizing two events in quite rapid succession is that the second could develop themes raised in the first. One of these was the issue of the gentrification of sound system culture to which the symposia themselves could be seen as contributing. This came up in discussions with participants after the first one and was addressed specifically in the second with Henriques’ presentation on the risks and opportunities of sound system culture, including its commercialization and “authenticity.” By this time however it appeared that participants already recognized that the events were attempting to add value to the culture rather than sanitize it. Another issue coming from the first that was addressed in final plenary of the second: “Soundwomen in the xxist Century” on the rise of all-female sound systems, one of the most important movements in the current scene, that has followed pioneering soundwomen like Valerie Robinson from V-Rocket Sound System. Legs Eleven (UK) Caya (Come As You Are) Sound System (UK, via Skype) and Feminine Hi Fi (Brazil, via Skype) told their stories, stressed the need to develop the narrative of dancehall and to work with music as a tool for social transformation. Sir Lloyd Coxsone, a founding figure of the first generation the UK sound system scene, was very supportive of the work the soundwomen were doing and proposed a “clash” between the sounds from UK and Brazil. 14Another lesson from the first Outernational was the importance of conceiving of the event as being double-sided with the discussion of the symposium in the day and the sound system session in the night. The evening opened in the music venue of a local pub, with a screening of a new documentary film Weapon is My Mouth, directed by Vidigal in collaboration with Delmar Mavignier, shot at the 2016 United Nations of Dub festival in Liverpool. Weapon Is My Mouth was conceived and made specifically as a “danceable film,” to be experienced, appreciated and danced to within the environment of a sound-system session. Projected between the speaker stacks, it is a new kind of expanded cinema, as a fusion of cinema and dancehall experience. Thus the Outernational approach of practice-as-research was pushed even further with this presentation of film-as-research. The evening continued with a full session featuring Ras Muffet’s Roots Injection from Bristol and Young Warrior from London, both with their own sound systems, in addition to a DJ set by the renowned filmmaker and selector Don Letts. 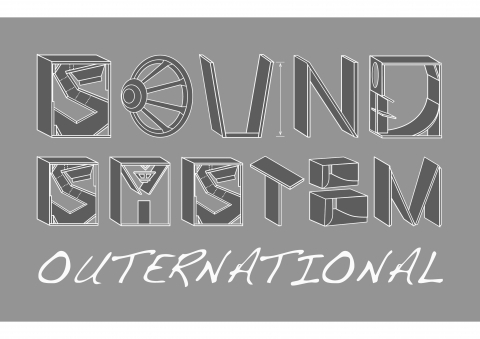 Sound System Outernational (SSO) is a much-needed platform for sound system culture, a long awaited breath of fresh air. SSO presented historic information, first hand accounts, from people who were in Jamaica during the inception of this culture. Seeing these accounts presented at the symposium felt historic. It also showed me that sound system culture is still growing and evolving, it’s just as relevant today as it has ever been. Meeting other people at the symposium who have the same love and passion for sound system culture was inspiring and gave me the opportunity to make connections, spark ideas and find collaborators. 18In conclusion, what came across very strongly from the events was that the intergenerational dimension of the discussions with Sir Lloyd Coxonne and other elders made most valuable contributions, they themselves appearing to value and respect how the younger generation were keeping the music and the culture alive and taking forward in their own ways. This value for the oral histories of the culture in the UK as expressed through its still-living originators and the music artifacts is an important theme for all the current research and exhibition projects and much work remains to be done.14 In these ways the archive—including the symposia—can serve as an amplifying loop based on mutual respect and recognition of practitioners and researchers that remains they key value for Sound System Outernational. It has certainly encouraged us to plan to establish a network of Sound System Research Centers at our respective Brazilian, Italian and UK institutions. 19One limitation of our reflexive methodology is the difficulty it poses for us as the organizers to be sufficiently self-critical. What is most important to point out to colleagues who might be considering similar events in the future concerns not so much any organizational shortcomings, but rather being aware of their impact on the scene. 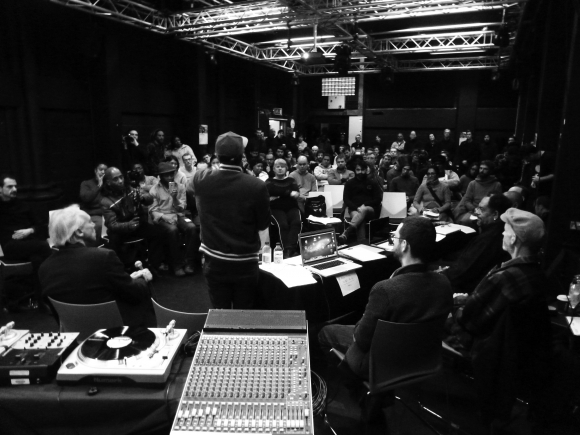 Taking up the issue of “gentrification” raised above, there are dangers to turning sound system culture into a “subject area” as the funded research initiatives cited above. To a much greater extend than dancehall, reggae music is essentially a music of rebellion and protest, as it was born in 1960s Jamaica and as it has been adopted by social movements in Italy and around the world. To take the music and the scene into the academic fold—without undermining its raison d’être—has to be with the full participation of those who feel and know it. It is this that might present an organizer’s biggest challenge. Albright Ann Copper (1997), Choreographing Difference: The Body and Identity in Contemporary Dance, Hanover, Wesleyan University Press. Bateman Christopher & Newman Al “Fingers” (2016) In Fine Style: The Dancehall Art of Wilfred Limonious, London, One Love Books. Browning Barbara (1995), Samba. Resistance in Motion, Bloomington and Indianapolis, Indiana University Press. Chevannes Barry (1994), Rastafari: Roots and Ideology, Syracuse, Syracuse University Press. Henriques Julian (2011), Sonic Bodies: Reggae Sound Systems, Performance Techniques and Ways of Knowing, London & New York, Continuum Books. Henriques Julian (2012), “Global Ear Kingston”, The Wire, no 340, p. 16. Henriques Julian (2014), “Rhythmic Bodies: Amplification, Inflection and Transduction in the Dance Performance Techniques of the ‘Bashment Gal’”, Body & Society, vol. 20, no 364, p. 79-112. Hitchins Ray (2014), Vibe Merchants: The Sound Creators of Jamaican Popular Music, London, Routledge. Huxtable Paul (2014), Sound System Culture, Celebrating Huddersfield’s Sound Systems, London, One Love Books. Merleau-Ponty Maurice (1964), The Primacy of Perception, Evanston, IL, Northwestern University Press. Veal Michael (2007), Dub. Soundscapes and Shattered Songs in Jamaican Reggae, Middletown, Wesleyan University Press. White Joy (2016), Urban Music and Entrepreneurship. Beats, Rhymes and Young People's Enterprise, London, Routledge. http://www.thewire.co.uk/audio/in-conversation/off-the-page-2014_julian-henriques-with-ras-moffat_bristol-dub-club_the-sound-system-unplu-33914 (accessed 8th March 2017). 3 There is a well-established official exchange relationship between Goldsmiths and L’Orientale for PhD student exchange and staff participation in seminars. 4 This may be exemplified by the huge popularity of South London sound system Saxon International during the 1980s and 1990s. This popularity eventually had an impact on records sales in the UK and abroad, with Saxon MC Papa Levi topping Jamaican Single Chart in 1982 with “Mi God Mi King.” Another prominent Saxon MC, Smiley Culture hit UK charts in the 1980s with hit singles “Cockney Translation” and “Police Officer” which blended British and Jamaican cultures, eventually leading him to host a TV show on Channel Four. 5 https://www.theguardian.com/uk-news/2016/mar/11/croydon-bar-accuses-police-banning-jamaican-bashment-music (accessed 8th March 2017). 6 See http://www.nae.org.uk/exhibition/rockers-soulheads-and-lovers-sound/91 (accessed 17th march 2017) http://www.onelovebooks.com/Sound-System-Culture-1 (accessed 8th March 2017). The concept for the book comes from Mandeep Samra and it was edited and designed by Al Fingers. 7 For the programme in full see https://soundsystemouternational.wordpress.com/ (accessed 8th March 2017). 8 The full programme is available on our blog, https://soundsystemouternational.wordpress.com/2016/06/24/sound-system-international-schedule/ (accessed 8th March 2017). 9 Conversation in a music bar in Tottenham, 8th September 2016. Lewis recognized D'Aquino as one of the speakers at the two events he had attended and wanted to share his positive comments. 10 Live Facebook streaming by Reggae Britannia, Outernational 1, 16th Jan. 2016, https://www.facebook.com/youngwarrioruk/videos/vb.184121970371/10156554081430372/?type=2&theater (accessed 15th May 2016). 11 http://www.skindeepmag.com/online-articles/skin-deep-meets-sound-system-culture/ (accessed 8th March 2017). 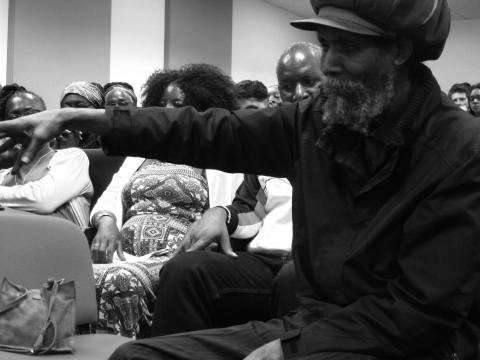 13 http://gtr.rcuk.ac.uk/projects?ref=AH/N001826/1, and http://www.ahrc.ac.uk/newsevents/events/calendar/reggae-research-network-symposium/; http://philharmoniedeparis.fr/en/museum-exhibitions/exhibitions/jamaica-jamaica (accessed 8th March 2017). 14 Recording of the live streaming on the day still available at https://www.facebook.com/Sound-System-Outernational-740364419397765/?ref=settings (accessed 8th March 2017) and Goldsmiths Sound System Research, see https://vimeo.com/180154347 (accessed 8th March 2017). 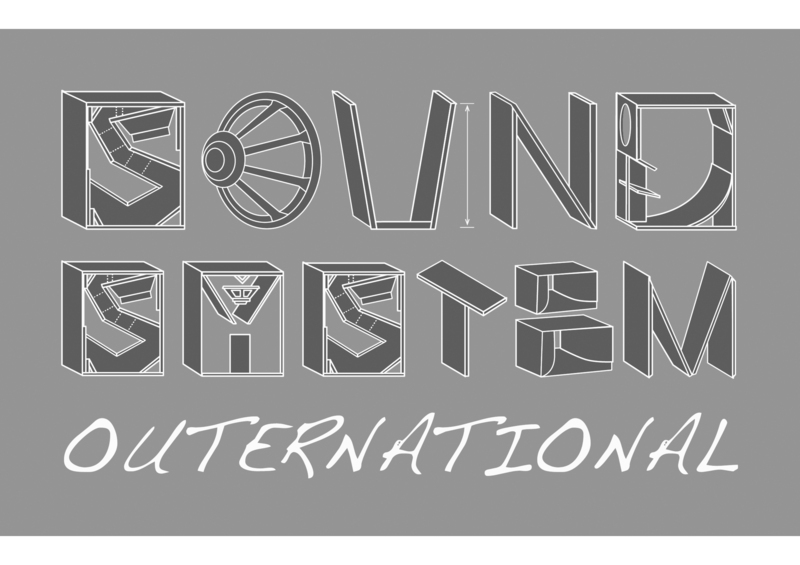 Brian D’Aquino, Julian Henriques et Leonardo Vidigal, « A Popular Culture Research Methodology: Sound System Outernational », Volume !, 13 : 2 | 2017, 163-175. Brian D’Aquino poursuit une thèse en études internationales à l’université de Naples L’Orientale. Sa recherche porte sur les liens entre musiques noires, culture populaire et technologies sonores. Il dirige par ailleurs le sound system et label Bababoom Hi Fi depuis 2004. Il va bientôt publier certains de ses travaux sur les musiques caribéennes en Europe dans l’Encyclopedia of Popular Music of the World (Bloomsbury, 2012). Julian Henriques est professeur à l’université de Londres, Goldsmiths, organisateur du programme de Master en écriture scénaristique et directeur du Topology Research Unit du Département de Médias et Communications. Auparavant, il dirigeait le département audiovisuel au Caribbean Institute of Media and Communication de l’University of the West Indies, Kingston. Il a écrit et réalisé la comédie musicale reggae Babymother et We the Ragamuffin. Sa recherche porte sur les cultures de rue, les liens entre musique et technologie, et se penche sur le son comme outil critique et créatif. Parmi ses sculptures sonores, on compte « Knots & Donuts » (2011) présentée à la Tate Modern. Il a notamment publié Changing the Subject (Routledge, 1998) et Sonic Bodies (Bloosmbury, 2011). Enfin, son ouvrage Sonic Media sera bientôt publié. Leonardo Vidigal, docteur en communications de masse (Universidade Federal de Minas Gerais, Brésil), enseigne l’animation et les arts numériques ainsi que les études filmiques à l’École des Beaux-Arts de l’UFMG. En 2015 et 2016, il fut visiting researcher à l’université de Londres, Goldsmiths, dans le cadre d’un postdoctorat dirigé par Julian Henriques. Il a réalisé un documentaire sur la culture des sound systems en Grande-Bretagne, Weapin is my Mouth (avec Delmar Mavignier, 2016). Il a publié le chapitre « Reggae Documentaries in Brazil » dans l’ouvrage Global Reggae dirigé par Carolyn Cooper (UWI Press, 2012). Peut-on parler de musique noire ? Les Éditions Mélanie Seteun & Volume ! S’inscire à la newsletter de Volume ! La collection "Musique & Société"
La collection "Musique & Environnement Professionnel"